I learnt an important lesson last week: once in a while you should check the expiration date of your fast action yeast. While there are many reasons why a yeasted dough may fail to rise properly (killing off the yeast by mixing it with too hot water or the salt in the dough impeding a proper rise or even a cold and drafty kitchen) one reason might simply be that your yeast has died. When my first batch of brioche dough failed to show any sort of action after leaving it in the admittedly cold kitchen overnight, I tried to figure out what had gone wrong. I checked the expiration date on the bottom of my tin and noticed that the date had just passed. I had another sealed tin (thankfully well within the expiration date) and decided to do a little test. I put the same amount of warm water and a pinch of sugar in two shallow bowls and added the older yeast to one of the bowls and the yeast from the freshly opened tin to the other bowl. I waited ca. 5 minutes and when I checked on both bowls the fresh yeast had clearly activated (there was a bubbly sponge floating on the surface with a strong yeasty smell) whereas the other bowl did not show any signs of ‘life’. After throwing out the old tin I set to work with a new batch of brioche dough, this time to great effect. Oh and before you start taking out your mixing bowl and your scales, I should warn you that while this recipe isn’t very involved, it is rather lengthy given the long proving times. And, as with most yeasted dough recipes, the key is not the time the dough has been left to prove but whether the dough has doubled in size (which, depending on conditions can take between 4-6 hours for this recipe but can also be quicker). I would therefore recommend making this recipe on a weekend (maybe starting the dough on a Friday night with the first proving done in the fridge or in a cool room and the second proving done the next morning). 1. The evening before you want to bake the brioche, dissolve the yeast in the milk and set aside for 10 minutes. 2. 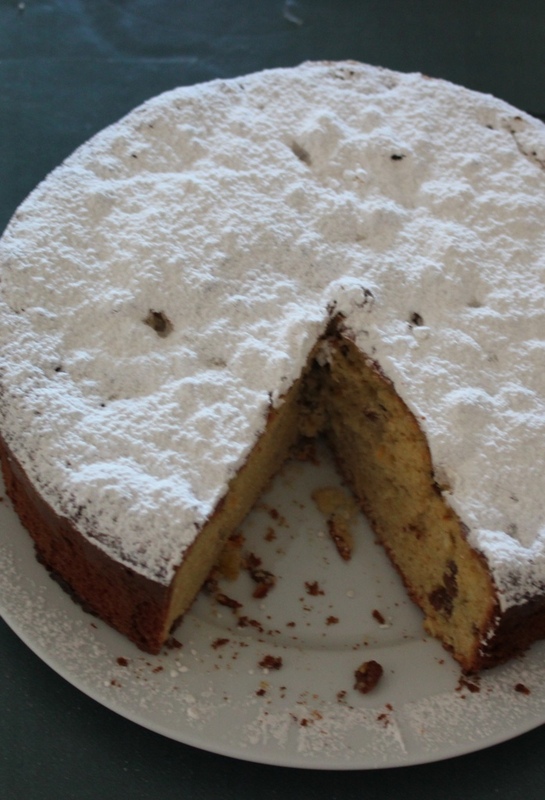 In a big mixing bowl combine the flour, the salt, sugar and cinnamon with a whisk and form a well in the centre and pour in the yeasty milk, the 4 eggs and 2 egg yolks, the chopped peel, soaked raisins and the butter. Mix by hand for 10 minutes or, using the dough hooks of an electric mixer, mix for 5 minutes on slow speed, or until the dough is elastic and the surface looks shiny. 3. Cover the bowl with oiled clingfilm and leave the dough to prove in a cool room overnight or until the dough has doubled in size (if you want to make the brioche during the day, start first thing in the morning and leave the dough to prove somewhere warm for 4-6 hours or until doubled in size). 4. The next morning, grease a round springform or loaf tin. 5. Carefully scrape the dough out of the bowl and unto the greased tin. Again, cover the baking tin with oiled clingfilm and leave to prove somewhere warm until the dough has doubled in size (this can take 4-6 hours, though, in my case, the second prove took only 3 hours). 6. Pre-heat the oven to 175 degrees Celsius once the dough has almost doubled in size. Remove the clingfilm and place the tin into the oven for ca. 30-40 minutes or until the brioche is golden-brown in colour and the tin sounds hollow when tapped from underneath. If the brioche starts browning too quickly (mine did), cover the tin loosely with aluminium foil. 7. Leave to cool for 5-10 minutes before carefully inverting onto a serving plate (it might help to run a sharp knife alongside the inner edge of your tin before inverting the brioche). Dust with icing sugar. Note: the Brioche is best eaten on the day it is baked as it will start going stale within 2-3 days, even if wrapped well. If that happens, don’t despair, Brioche makes for a wonderful (if slightly decadent) French Toast or Bread and Butter Pudding. Also, if you prefer your Brioche plain, just leave out the soaked raisins, orange peel and cinnamon. I’ve had exactly the same problem with yeast before – it’s SO disappointing when all your hard work goes to waste. This brioche looks lovely – 100% agree with the comment above, slice for breakfast would be perfect! Thank you! And yes – I absolutely hate wasting food (especially when you try to use organic products …). 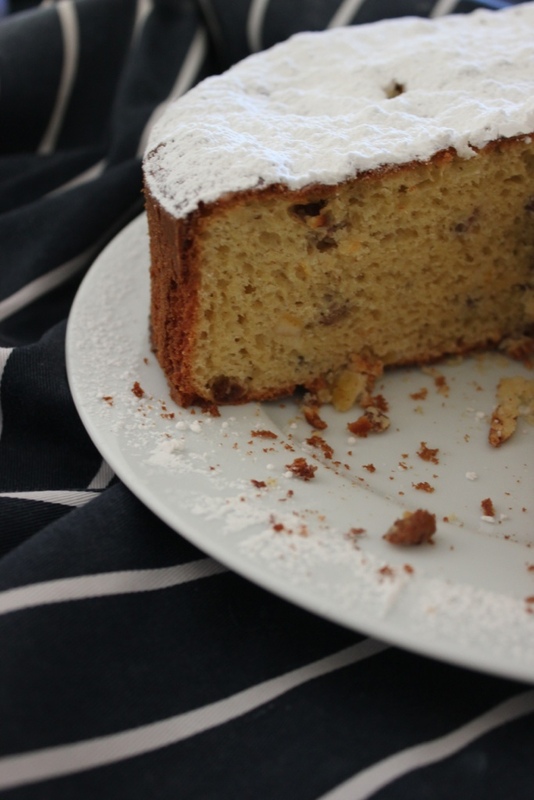 I am tempted to make another brioche – maybe this time with orange zest and chocolate chips … or plain and have it with some lemon curd for breakfast. Hmmm. Orange brioche sounds like a dream. Lovely blog and photos! Thank you for the sweet comment! I love your blog and beautiful photos so I really appreciate you stopping by and leaving such a nice comment, made by day! I’m working my way through the Mathiot brioche recipes now. First two – very wet doughs, more like batters. It’s an interesting challenge. 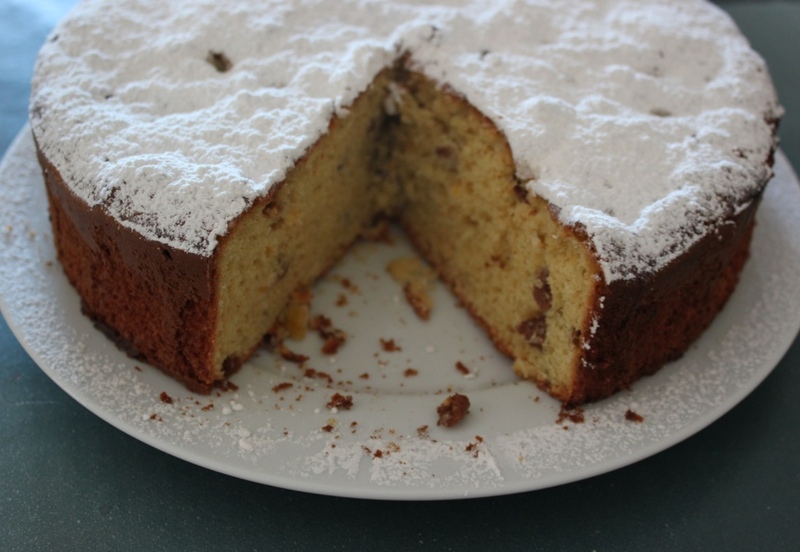 This one looks good – with the candied fruit, like a panettone. I agree her Brioche recipes are surprisingly wet – if I remember correctly that was the reason I baked that one in a springform as it was impossible to shape. It did rise beautifully though. What do you think of the recipes otherwise? I am finding the book a bit hit and miss. I did buy the English version so maybe the translations are not always accurate but there really are some oddities – e.g. her recipe for financiers is the only one I ever came across that requires you to beat the egg whites until stiff (and the resulting financiers are much lighter than the dense little cakes you can buy in French bakeries). Yes, I’m finding it hit and miss too. The baking times & oven temps (I use an oven thermometer) generally seem too long and too high. Not sure I am glad to hear I am not the only one finding it hit and miss! Are there any recipes in the book you particularly enjoyed? Hi Sophia. Yes, I generally like the book – just need to watch the bake!